Alaveteli is our Freedom of Information platform – Ruby on Rails code for running a site like WhatDoTheyKnow.com. It can be deployed in any country, in any language, and within any legislation. Your site will make it easy for people to ask questions of public authorities, and it will automatically publish these questions, and their answers, online. 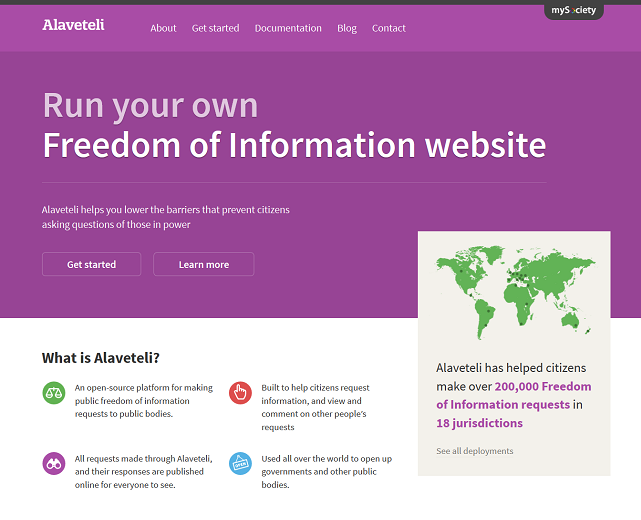 If your country gives its citizens the Right to Know by law, you can use Alaveteli to launch your own Freedom of Information site, and simplify the process of requesting information. If your country has no such legislation, you can still run an Alaveteli site to send questions to those in power – and you may just find that it gets things changed. 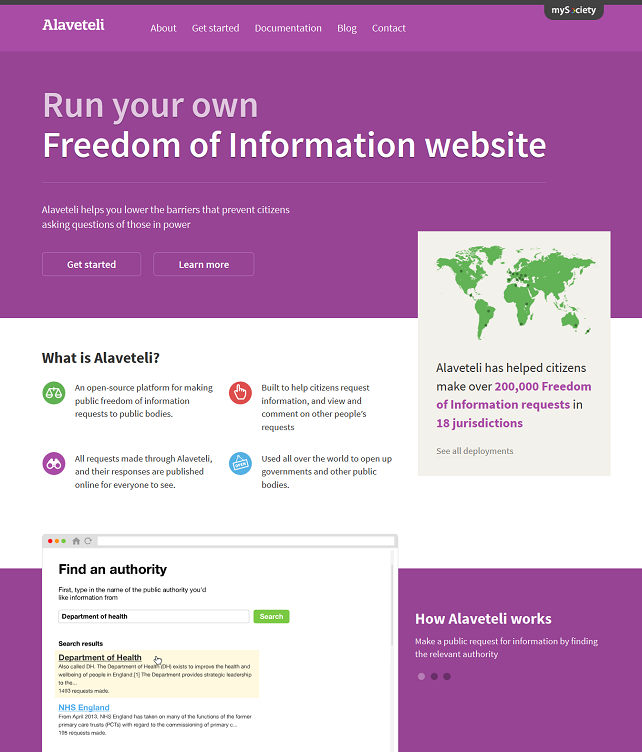 There are Freedom of Information sites using Alaveteli in many countries, including Hungary, New Zealand, Ukraine, and Israel – with more coming soon. There’s even a site covering the European Union. Hundreds of thousands of requests have been made through all the Alaveteli sites worldwide. Alaveteli is open source code, so it’s free to use, modify and contribute to. There’s a supportive community to help you along the way, where you’ll find many people who have already set up their own Alaveteli website – people who are well placed to answer any questions you may have. WhatDoTheyKnow in the United Kingdom has processed hundreds of thousands of FOI requests from UK citizens. InfoLib in Liberia is an Alaveteli site for a nation where many are offline. It works, thanks to back-up training, outreach, and local radio. Dostup Pravda helps users seek the truth and information in a post-revolutionary Ukraine. Ask Your Government Uganda is an unprecendented way for citizens to access their rights under FOI. AskTheEU covers the whole of Europe. KiMitTud in Hungary works closely with journalists to break news stories based on FOI. A Freedom of Information toolkit for journalists, campaigners and organisations. Find out more. 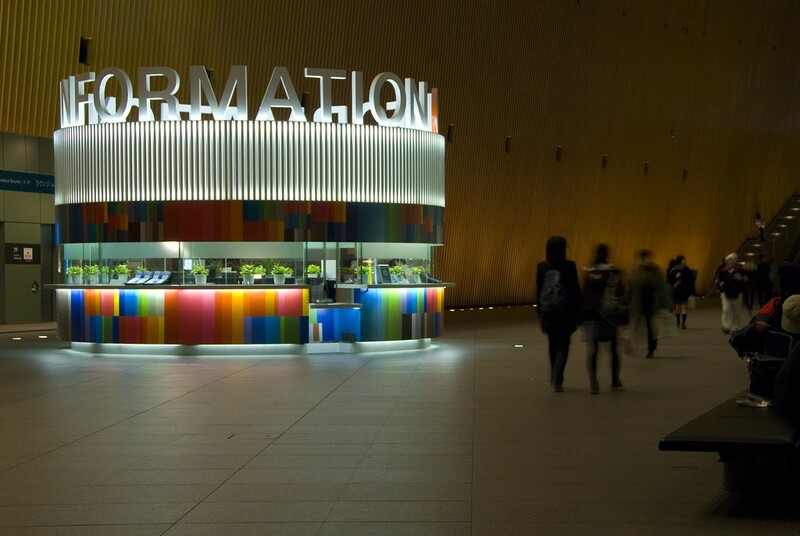 Read our recent research into the impact of Freedom of Information websites.